The opening hole is the perfect way to start the round. After driving to a wide and inviting fairway, the second shot requires great precision with the green well protected by a huge bunker on the left-hand side. Missing the green right will leave a very fast downhill chip. The first par-three of the round. It’s not the longest short hole on the course, but demands a precise tee shot with the narrow green surrounded by several bunkers that MAKES getting up and down a real challenge. 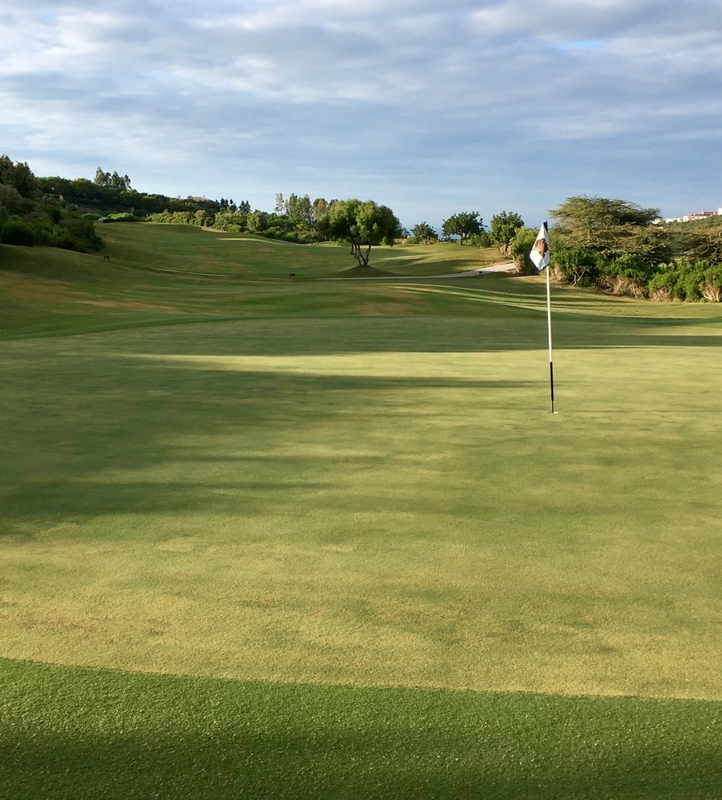 The shape of the green is unique since it has several small landing areas, so it’s always better to leave a putt short of the hole or you will face a challenging downhiller. Beware of the wind since the tees are slightly elevated, making clubbing tricky. 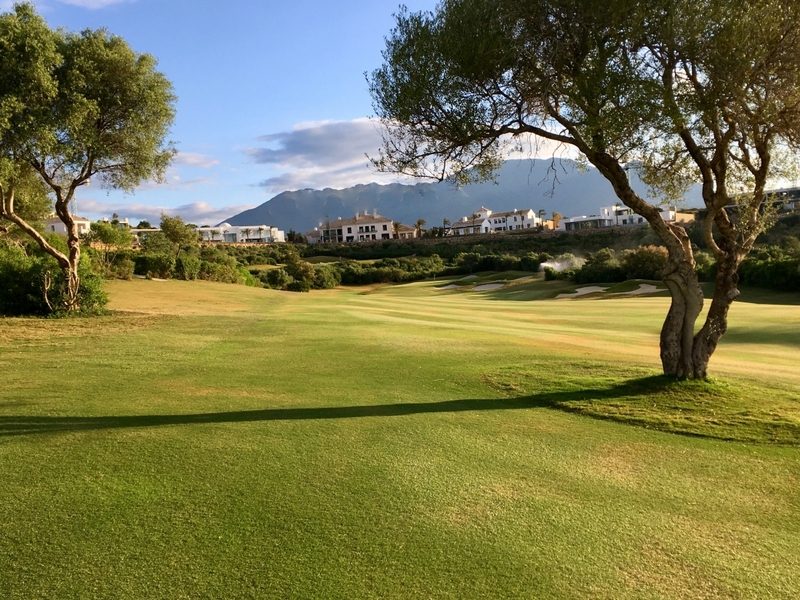 A beautiful par-five with all the assets needed for a great golf hole: a wide fairway, a big lateral water hazard, great views and a great pay-off if you decide to go for the small green and are successful. Beware of the bunker right of the green as finding it will leave a difficult bunker shot with the threat of water behind. For the shorter hitters, be careful with the lay-up as water comes into play at all times. 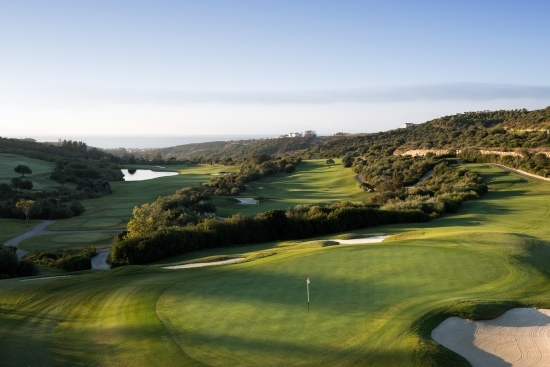 The hole also offers beautiful views of the Mediterranean which will live long in the memory. A great risk-and-reward par-four, long hitters must decide whether to take on the challenge of going for a green very much in range, knowing a huge lake awaits for tee shots that are not perfectly struck. For those choosing to lay-up, a long iron or fairway wood is the right choice, but watch out for the severely-sloping green and difficult pin positions when playing your approach. Another fantastic par-five, the fairway gets tighter and tighter the closer you get to the green. Very few players will reach in two but many will be tempted. The green is extremely narrow for a long hole, and demands great accuracy when attacking the flag. An array of attractively-shaped bunkers protect the green while beware of the big slope on the left-hand side of the putting surface. A very long par-three with a huge flat green, par is always a good score here. 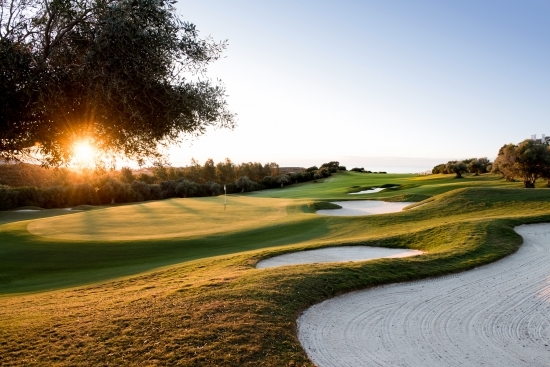 Avoid leaving your tee shot short of the green as a collection of deep bunkers lie in wait for any under-hit shots. The good miss is on the left side. 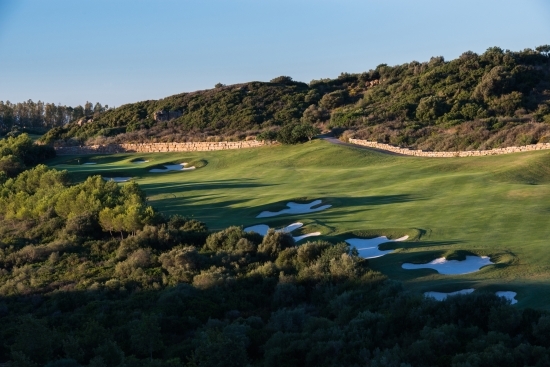 The longest par-four on the Costa del Sol and stroke index one at Finca Cortesin, the seventh hole is simply a “monster”. 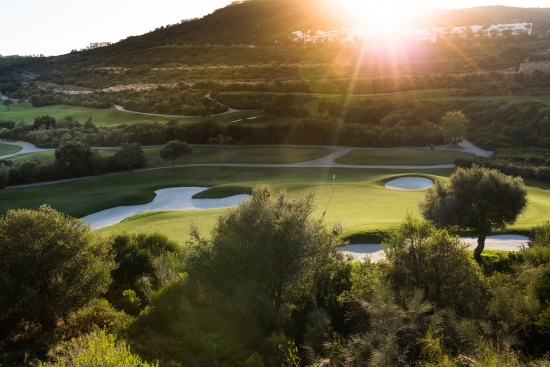 The hole features an inviting, wide fairway, but tee shots must avoid some cleverly-placed bunkers if you’re to have a chance of reaching the green. The approach requires a long iron to a big green and there is plenty of room on the left-hand side, but that will leave a tricky downhill chip shot requiring the deftest of touches. 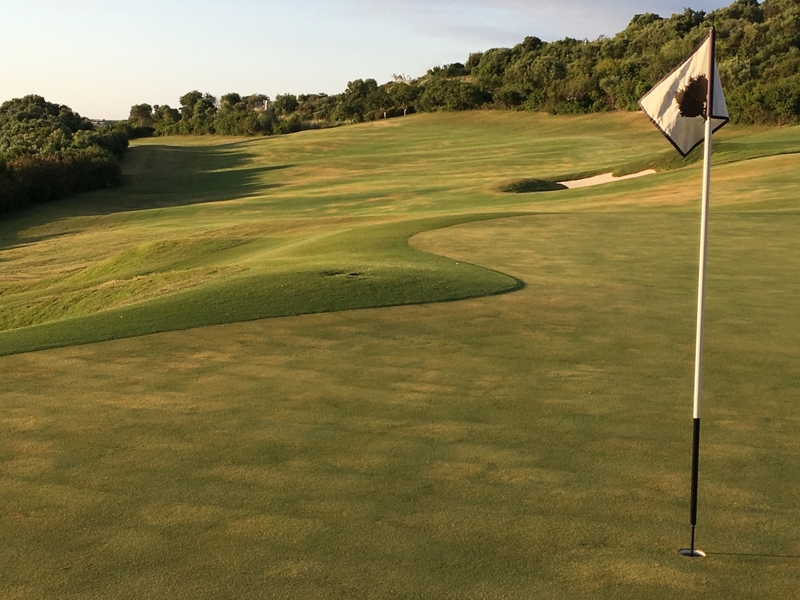 The best option is to keep it short with your second or third shots to leave an uphill putt on this fast green. A very difficult par-five with a tight fairway. The drive must be hit with a fade to avoid bunkers on the left-hand side, and long hitters should probably go with a fairway wood from the tee to be safe. The second shot requires great strategy since the lay-up area is surrounded by bunkers and bushes on the left. Take advantage of the right-hand slope to keep your ball in play since all balls will roll down to the fairway or green. The views from the green to the hotel and clubhouse, with the Mediterranean in the background, are spectacular. 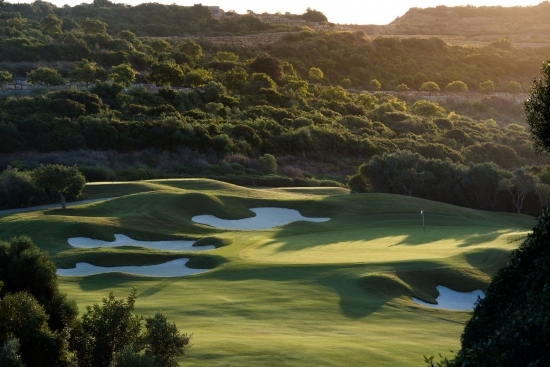 A great short par-four that proves that a great hole doesn’t have to be long. A straightforward tee shot is played to a wide fairway which sets up a challenging approach to the green. Most players will go for the elevated green with a very short iron to a small and narrow target, but miscue and you will face a very delicate chip. 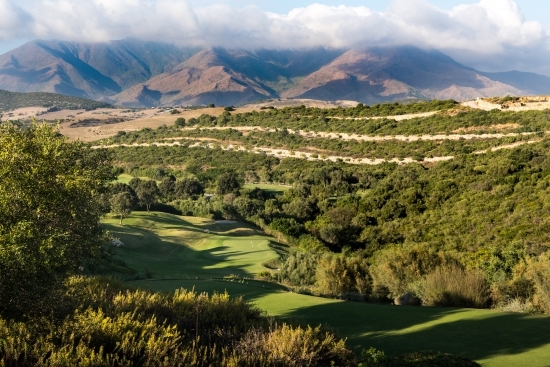 Make sure you take time to check out the views over the hotel at this hole, as the ninth is one of Finca Cortesin’s jewels. 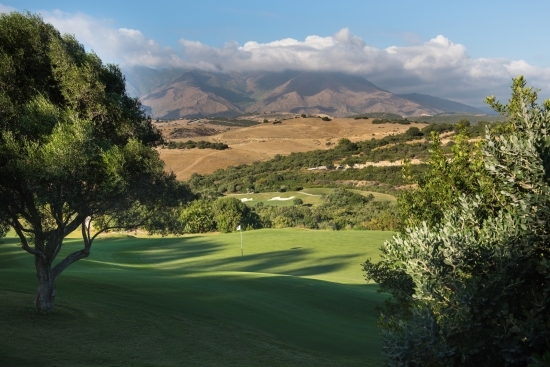 This par-three is one of the best and most spectacular holes on the course and serves up great views of the Estepona Mountains. It doesn’t play very long, but the green is very narrow (with a Spanish Guitar shape) and is well protected by water on the right. Be careful with the wind, as club selection is always difficult from the elevated tee. 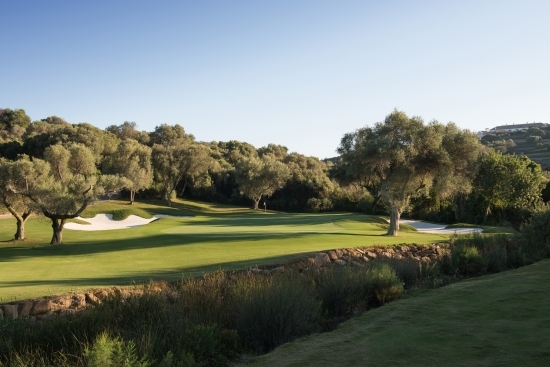 A double dogleg par-five, Finca Cortesin’s 11th hole features a wide fairway and a semi-blind second shot to a small landing area protected with bunkers on the left and water hazard on the right. Keep the second shot left as the fairway strongly slopes to the right. A beautiful natural stream runs along the right side of the hole. Measuring almost 600 metres from the back tees, only the best players will have a chance to putt for eagle. The 12th hole is one to savour and is a very fair par-three. The tee shot is hit from an elevated tee to a huge green which is surrounded by several deep bunkers. The putting surface is the biggest on the course but one of the most difficult to read. 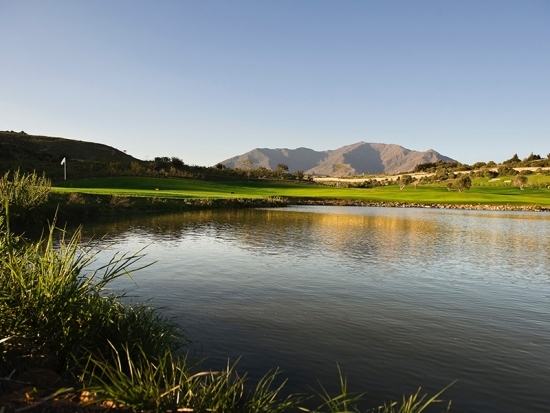 This is Finca Cortesin’s signature hole. A spectacular par-four, players drive to a wide fairway, avoiding a water hazard which runs left of the fairway and across the front of the green. 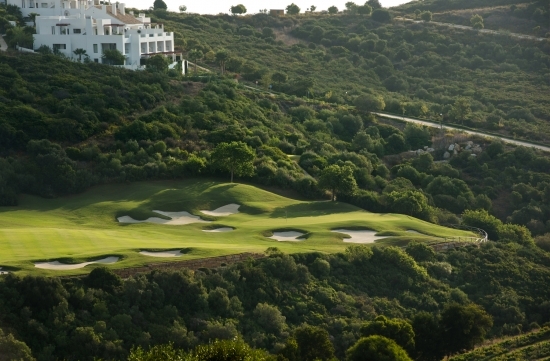 Bunkers right and left complete what is one of Spain’s most beautiful approach shots. This is a lovely, picturesque hole surrounded by traditional old Acebuches (typical local trees). The green is large and sloping, allowing for several different pin positions. Another short par-four that offers a real birdie opportunity (and even some eagles as well!). The architect decided to give players a break when designing it before they embark on the challenging finishing stretch. The hole has a very wide fairway, big green and many bunkers that make for a picture-perfect setting, especially seen from the clubhouse. Make sure you stay left to avoid the hazard on the right-hand side. One of the most demanding holes on the course, players must carry a huge stream to reach the fairway before facing a second shot hit off an uneven lie to a small and well-protected elevated green. 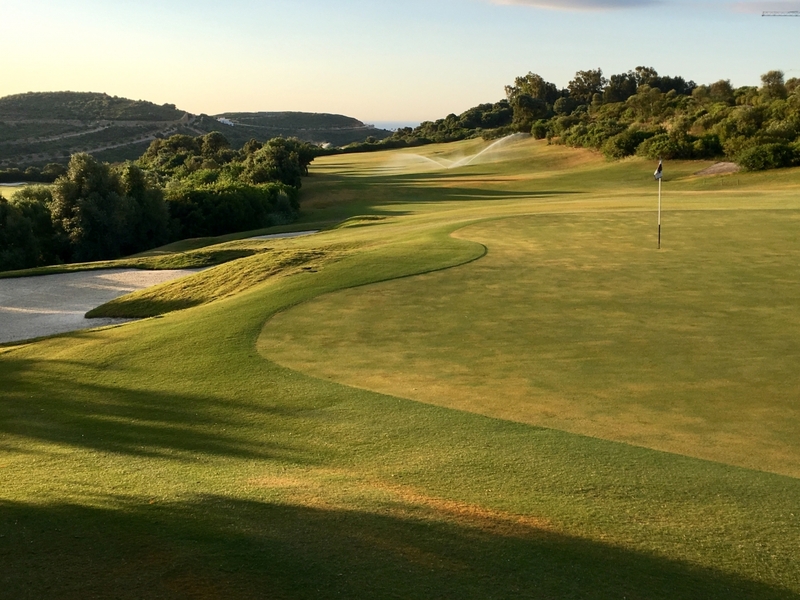 Always take more club than you think for the second shot and enjoy the great views of the Mediterranean once you have safely negotiated the lightning-quick green. 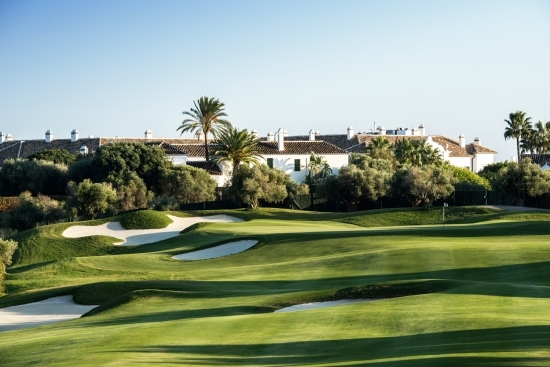 A great left-to-right dogleg, the 16th hole is long, demanding and challenges players to find a small landing area from the tee between two large bunkers, and a narrow green that has several difficult pin positions with the second shot. The bunkers on the left side of the green will force you to stay to the right, leaving either a very fast downhill putt or chip. The shortest par-three on the course, but without doubt the most technical. Precision is needed when attempting to hit the green, especially when the pin is back left. 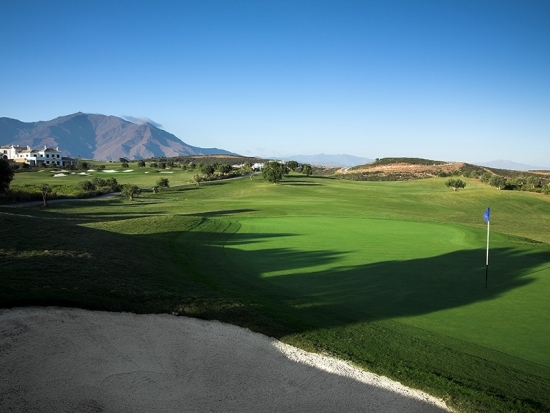 The sloping green will test even the best of putters, and take the chance to enjoy the stunning views of the Estepona Sierra in the background. A great finishing hole. 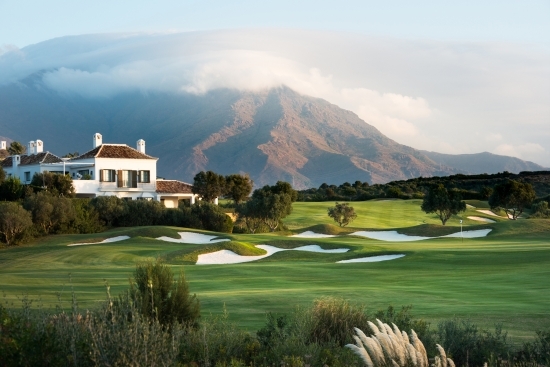 Finca Cortesin’s 18th is a reachable par-five that allows big hitters to really open their shoulders off the tee as the fairway is the widest on the course. The second shot leaves many options. Big hitters must take into consideration the very small green and out-of-bounds on the left and a bunker and bushes to the right. For the average golfer, be careful when laying up as a huge bunker protects the landing area 100 metres from the green. 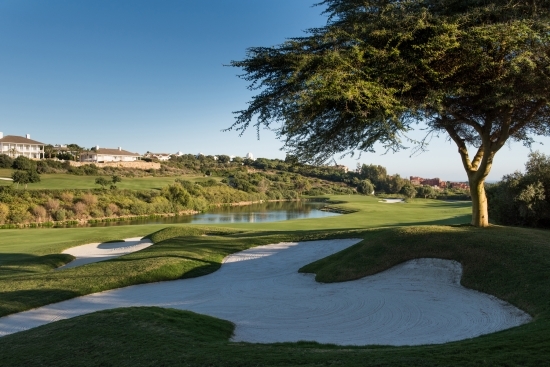 This is a great match play hole with many options, risks and rewards to be taken and enjoyed.